Dubai: Opener Usman Khawaja hit a fighting hundred to foil Pakistan and help Australia escape with a draw in the first Test in Dubai on Thursday. Both had some anxious moments before players shook hands with one ball to go in leg-spinner Yasir´s final over. Australia´s hero was Khawaja, who started the day on 50 not out as Australia resumed on 136-3. His innings was the second longest in the fourth innings of a Test, behind England´s Michael Atherton´s 645 minute vigil in scoring 185 not out against South Africa in Johannesburg in 1995. It was the highest fourth-innings score by any visiting batsman in Asia, beating New Zealand´s Daniel Vettori´s 140 made at Colombo against Sri Lanka nine years ago. Pakistan could have had Head leg-before off leg-spinner Yasir on 44, but Sarfraz did not review umpire Richard Kettleborough´s not out decision. Replays showed the ball was hitting the stumps. Pakistan opener Imam-ul-Haq will miss the match after he suffered a fractured finger fielding on Thursday. Yasir Shah to Starc, OUT, what a catch! Bilal Asif to Paine, no run, Huge shout for LBW! Not out says Umpire Kettleborough. Sarfraz reviews! Big inside edge. Mohammad Abbas to Paine, 2 runs, full inswinger, squeezes off a thick inside edge behind square! Australia now need 143 runs to win from 23 overs to pull off a remarkable victory against Pakistan. Dubai: Opener Usman Khawaja hit a fighting hundred to keep Pakistan´s victory bid in check as Australia reached tea at 287-5 on the final day of the first Test in Dubai. Khawaja was unbeaten on 120 for his seventh Test century and with him skipper Tim Paine was 19 not out as Australia -- set a daunting 462-run target -- need to bat out another 31 overs for a draw. Pakistan need five more wickets and have another 175 runs to play to take a 1-0 lead in the two-match series. 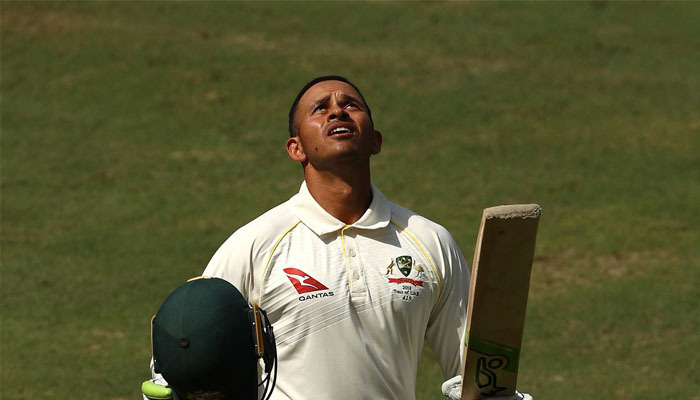 Khawaja had added an invaluable 132 runs for the fourth wicket with Travis Head (72) as Pakistan failed to get a single wicket in the first session after Australia resumed at 136-3. Khawaja took a single to short mid-wicket off to Mohammad Hafeez to complete his century that has so far included 11 boundaries. No team has successfully chased more than the 418-7 West Indies made against Australia in the Antigua Test in 2003. Pakistan had expected early wickets after jolting Australia to 136-3 at the close on the fourth day, but nothing worked for skipper Sarfraz Ahmed, who made multiple bowling changes. Pakistan could have had Head leg-before off leg-spinner Yasir Shah on 44, but Sarfraz did not review English umpire Richard Kettleborough´s not out decision when replays showed the ball hitting the wickets. Pakistan were only rewarded after lunch when they took the second new ball as soon as it was due and Hafeez trapped Head leg-before with the first ball. Yasir Shah took his first in the match when he dismissed Marnus Labuschagne for 13.